Color(s): White or white and black. White is preferred. The Coton originated in the island of Madagascar in the early 20th century. They are still considered to be a rare breed in the United States, where there are only perhaps 5,000 total. The American Kennel Club does not yet recognize the Coton, and as such, there is no uniform standard. 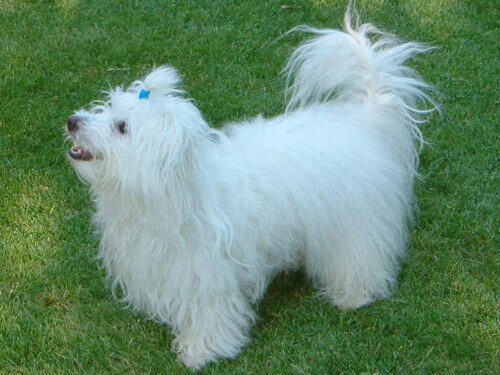 The Coton de Tulear is an adaptable and boisterous companion. They thrive on being an integral part of the family, and do not like to be left alone for an extended length of time. They are content to be on your lap or at your feet, but are also instantly ready for play or a ride in the car. The Coton de Tulear is alert and territorial. They form strong attachments to both Master and family. They will alert to danger by barking, but only when it is necessary. They are extremely intelligent and love all of the attention they can get. The Coton is very social and enjoys outings and experiences. They get along well with other pets and children. The Coton requires frequent brushing and combing to keep the coat free of matting. Special attention must be given to the undercoat. They may also be given a cropped cut. This breed has no significant genetic diseases built into it due to its rarity. Breeders have been very careful to keep the Coton line pure. Coton is French for cotton. Hence, this breeds coat is fluffy and cottony, not silky. There is a long topcoat that is dry, dirt shedding, and non-oily. Most but not all Cotons will have a fine, thin, downy undercoat. The Coton de Tulear is bright and intelligent, but may be slow to mature. They may be difficult to housebreak. They do well with early socialization and obedience training. They require firm, consistent, and loving direction and do very well with a lot of praise and direction. This breed is an indoor companion. They do not require high levels of exercise, but do need a short walk every day. They also appreciate play sessions as often as possible. They adjust and adapt well to apartment, condo, and urban living. They have the capability and endurance for long hikes.